Shaped of polished quartz, a pyramid shows perfect symmetry and extraordinary beauty. A gentle gemstone believed to attract balance and harmony, white quartz is believed to act as a stimulant, equilibrator, and activator of energies. It cleanses the aura, thus relieving stress. 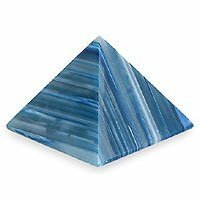 Regarded as the stone of good fortune and happiness, blue agate is transformed into a mystical and energizing pyramid. Agates in general are linked to the planet's energy; blue agate in particular is believed to awaken, activate, and stimulate. Pyramids are believed to reinforce a person's energetic field and protect against all sorts of negative energies. As such, pyramids are also thought to bring balance. New Age healers consider the energy emanating from pyramids to be capable of acting upon the environment and to heal a variety of ailments. The pendulum is a decision-making tool to help you get in touch with your sincere desire, or with any other help you might require. The beauty of a pendulum is its ability to only answer yes, no or maybe to a question. 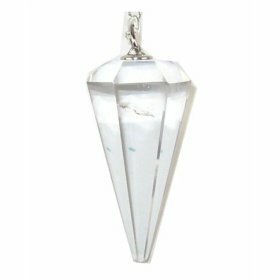 Pendulums may be totally clear and transparent, or they may contain streaks, lines, rainbows, water bubbles or other inclusions. Optical clarity has little to do with a crystal's quality and its ability to amplify the subtle energies. These inclusions are natural, adding character to the crystal and does not effect the performance of the Pendulum. They will bring energy and harmony to any interior. 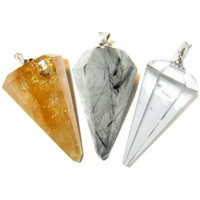 According to Feng Shui practices, each crystal pendulum should ideally be hanging from doorknobs and doorways, intercepting the flow of energy. 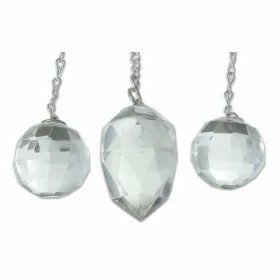 These faceted crystal pendulums hang from brass chains. 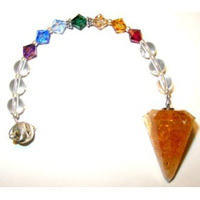 This Citrine Pendulum is approximately 6 inches in lenght. It has a Sterling Silver Ball on the end to hold on to. It has Crystal Quartz Beads and also has Swarovski Crystal Beads in the Seven colors of the Chakras and has Silver Beads on the chain. Pendulums may be totally clear and transparent, or they may contain streaks, lines, rainbows, water bubbles or other inclusions. 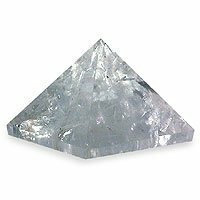 Optical clarity has little to do with a crystal's quality and its ability to amplify the subtle energies. These inclusions are natural, adding character to the crystal and does not effect the performance of the Pendulum. 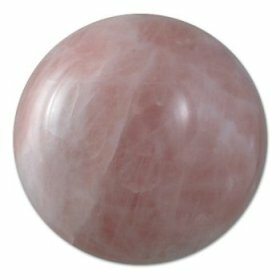 A perfect sphere of rose quartz rendering it a powerful tool. According to New Age healers, the energy emanating from the mineral taps into emotional vibrations and liberates them, purifying and transforming. Quartz crystal balls are specifically made to energize an environment while rose quartz is believed to foster love of self. The universal stone of romance is flawlessly cut into the shape of a heart, enhancing its power to attract love. The sacred stone of the planet Venus, believed to improve interpersonal relationships at work. At home, rose quartz creates a welcoming environment, stimulating feelings of love, tenderness, and tranquility. Many believe rose quartz also heals emotional wounds while promoting self-love. 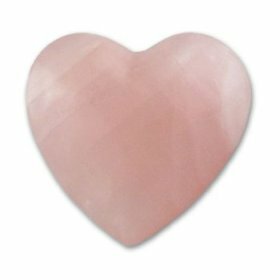 Of mystical significance, this rose quartz heart makes a perfect gift to share with a loved one. 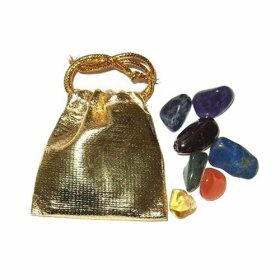 This marvelous pouch has all seven crystals of the Chakras. Carry in your pocket or purse to keep your Chakras Balanced. Root Chakra-Garnet. Navel Chakra-Citrine. Solar Plexus-Carnelian. Heart Chakra-Aventurine. Throat Chakra-Lapis Lazulli. Third Eye- Sodalite. Crown Chakra-Amethyst.